“You will be hollow. We shall squeeze you empty. Someone may be honored as a man of God in this degraded age, but his being so honored does not automatically make it so. 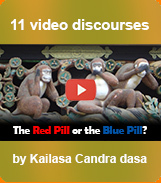 People are easily deluded and misguided in Kali-yuga. If you think that this does not go on in the name of Kåñëa–or in what appears to be the Kåñëa consciousness movement–guess again. The fresh princes of “ISKCON” cut quite the profile, no doubt, but that does not mean that they are actually men of God. They are not as reliable or as honest or as loving as they superficially may appear to be. It is incumbent upon us to explore the root issues of what undergirds the fabricated, so-called “ISKCON” confederation: The belief it holds of its inevitable triumph. In order to discern whether or not its theocratic oligarchy has any right to call itself a godly movement, we must consider its formative concepts and logic. Should its biggest, high-profile players be accorded the status of god-men? Çréla Prabhupäda’s original movement had a different aim than what its perverted reflection now has, and this must be recognized in order not to be deluded by the greatest show-bottle on earth, the ISK-con game. The eleven pretender äcäryas from back in the day were all rascals, and the governing board that empowered them in their zonal playgrounds was also rascal. All of them together—particularly since the zonals were themselves commissioners—formulated and founded a new religious sect. Its culture was and remains different from what Prabhupäda’s movement represented in the Sixties and the early to mid-Seventies. In order to unify our intention, aim, and sevä in Kåñëa consciousness, we cannot continue to ignore “ISKCON” for what it was back then and for what it is now: A great pretension. If it is able to distract you from the Absolute Truth of genuine guru and genuine initiation, then it has succeeded in channeling the prakñepätmika-çakti by tearing you away from reality and into its own pretense. It will not stop there. It will go on to swallow you. It does so primarily through its most powerful representatives, the “ISKCON” god-men. Let us consider just what they are. First, however, let us delve into the root issues that they so conveniently bury, and we shall also see why they ignore them. When Çréla Prabhupäda’s Kåñëa movement was first noticed by the Western intelligentsia, it was soon after analyzed by professors interested in it. They wanted to examine, in some depth, its roots and its potential. The basic issue underlying their study of his branch of the Gauòéya movement was whether or not it was actually rooted in Caitanya’s genuine teachings. If so, that was potentially the beginning of a trans-national world culture. If it was concluded by them that it was so rooted, then their study would center upon the long-range social and political effects that might result from this new counter-culture. Of course, all of this relied upon the root teachings that were the foundation of the movement. These are the issue now. Prabhupäda, in the Sixties, insisted that his Kåñëa movement was the best solution for solving the world’s problems, and that it was the best trans-cosmic culture for making everyone happy. Of course, none of that could actually prove to be true if its foundation did not continue to be bona fide. Its current manifestation–or, if you will, apparent manifestation at this time–has deviated from the Founder’s orders in a major way. Nevertheless, it superficially still appears to be a genuine trans-national religion representing Vedic and Vaiñëava culture. For its leaders, such appearances mean everything. As such, it behooves them to ignore the root issues which indicate otherwise, because actually confronting those could prove disastrous relative to the favorable Western media and collegiate intellectual class. On the other hand, we must not ignore those root issues. We have no crying need—and certainly no spiritual or devotional need—to preserve the “ISKCON” counter-culture. There can be no lasting goodness in the world when there is no bedrock Truth upholding it. Truth is more important than institutions or ephemeral manifestations. We have no deep attachment to any of the beneficiaries of the current scam, despite whatever attractive qualities they may still possess. We want real authority, and real authority must be free from compromise, free from lies, free from deviation, and free from corruption. We do not want the cheap guru/cheap disciple syndrome. Corruption is everywhere when it comes to the fabricated, so-called “ISKCON” confederation. However, centering our attention upon that cultural milieu—in which Hinduization has now become quite prominent–proves ultimately a distraction. Perhaps, about two hundred people (comprising its upper echelons) now enjoy, and/or benefit substantially from, the current set-up. But what a price the rest of the devotee world must pay in order for them to live life in luxury that way! Indeed, indirectly, what a price the whole world is paying in order for a handful of people to enjoy like that! It’s their movement now, granted, but that apa-sampradäya is simply a branch that is no longer connected to the Gauòéya guru-paramparä. It will function for some time longer, sure, but as the root issues become more and more clarified, more and more people will recognize that “ISKCON” is a dying institution. It will degenerate to the point that a stark realization will become apparent: Real authority has not been present in it since the late Seventies. This needs to be known, and it is becoming known. Its lies must be exposed, certainly. Still, most of the lies are tactics incorporated into the cult’s overall strategy. Most of the lies, including the half-truths (which are their most potent manifestations), are superficial. By instead focusing upon the root issues, we automatically confront the big lie which keeps the superstructure afloat. There is no need to focus on all of the other lies, scandals, slanders, rumors, and innuendos. As far as compromise is concerned, confronting the root issues automatically solves that problem, because the truth about the root issues is free from compromise. “ISKCON” is in no position, at the current time, to petition for adjustments. It must make very deep and abiding admissions and amends before adjustments can even be considered. Confronting the root issue and no compromise go well together, like black and white swans. The deviation is the root issue. The root issue always remains guru and disciple, as in genuine guru and genuine disciple. Their relationship entails initiation or, to be more specific, initiations (in the plural). Were The Magnificent Eleven genuine gurus? This is the root issue. Answer: Most definitely they were not. Then, if you accept that truth, how could any of their initiations actually have been bona fide? Answer: Most definitely they were not. Then, if you accept such obvious and basic logic—which is cent-per-cent in accord with guru, sädhu, and çästra—you must ask yourself: Did the governing body of the cult (its power node) actually uproot the massive deviation? This answer is just as self-evident as the previous ones. Indeed, the Governing Body Commission is fully responsible for implementing the colossal hoax in the very beginning, and it did nothing to uproot it. Instead, it covered it over by implementing transformations. Once one major mistake became known, it covered that over by making two more, and once they became known, it covered them over by making four more, ad nauseum. The Äcärya Board is no more. The Magnificent Eleven are no more–but a few of them are still initiating. At least one of them, authorized by the G.B.C. to do so, is still accepting uttama-adhikäré worship. The post-1977 “initiated” disciples—some of them, anyway—are still active in “ISKCON.” Indeed, a number of them are influential in the cult. The Absolute Truth will prevail, but it currently appears to be in distant second place when it comes to the counter-culture that “ISKCON” continues to push via its Third Transformation. Such a flowery Hinduization program: Nice but dead. We want real authority. It is not to be found in “ISKCON.” Nevertheless, if you want to overcome its imposition—particularly if it still influences you internally—then simply return to the root issues. Demand nothing less than the real answers. You want to put the pieces of the puzzle together? If so, you must prove that to the Paramätmä. History is being destroyed, but we must not let that happen. Some realizations will hurt in the beginning, but that is known as tapasya. . . and that is wanted. Leading Secretary: . . . he has no money. He’s simply at his job. He gets so much money. Prabhupäda: And he’s working somewhere? Leading Secretary: Yes, he’s working. He’s on Oxford Street, very near. Prabhupäda: And he says that he’s M.A., Ph.D.? . . . Leading Secretary: Yes, he’s a graduate. . . but still not so influential. Prabhupäda: Neither you are. Is he reliable? “ISKCON” finds itself locked into The Law of Diminishing Returns. There’s a point of no return, and that organization and its diehards reached that point long ago. Interestingly enough, this viewpoint is also held by them in relation to those who have left their camp and taken to different ways of prosecuting Kåñëa consciousness. Once a china bowl drops to the floor and smashes, no matter how expert a renovator may be in attempting to reassemble it, the artifact can never be put back together as good as it once was. Direction of Management, formative document of the G.B.C. The G.B.C. was an instrument, a tool. Sometimes, tools break or become warped. In those cases, they are no longer useful. The G.B.C. was always subordinate to the uttama-adhikäré founder of The Society. This was by design. Pure devotion is actually the monopoly of the pure devotee, not a management tool—and particularly, not one gone bad. From the letter to Rüpänuga, who was an original commissioner and still a G.B.C. 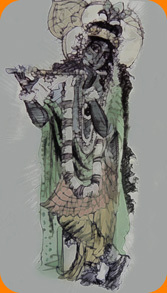 at that time (1974), Prabhupäda indicates that the G.B.C. is a time-serving entity. When the next mahäbhägavat emerges, it recognizes him, selects him to lead, and subordinates itself and the institution to him for the foreseeable future. G.B.C. was and is not so important. Once the real Äcärya emerges, it becomes even less important than it once was. It was (past tense) only important, of course, while it remained (past tense) bona fide. It is the Äcärya who leads his institution and his flock as the emblem of the perfect and pure power of inevitability. Political entities must always be there, but, in Kåñëa consciousness, they are only valuable if they are honest and pure. Such has not been the case for decades relative to “ISKCON” and its power node, the vitiated G.B.C. The whole conglomeration has proven itself utterly unreliable. If you rely upon it, you are depending upon that which is not. That will not prove helpful to your spiritual life, and you will experience massive disillusionment in due course of time—if you haven’t experienced it already. Q: When they must have known that Prabhupäda did not authorize them to imitate uttama-adhikäré, why did the eleven zonals still forge ahead as pretender mahäbhägavats? 13) Many of them were already sahajiyäs, so why not put the pedal to the metal? 21) How could Prabhupäda be genuine if he did not create uttama-adhikärés? 30) Sometimes, the dragon wins. Q:What do you mean by the politics of “ISKCON” inevitability? A: There are many understandings to be gleaned from this phrase, all of them interrelated. You see, the “ISKCON” leaders needed to stamp out individuality and rational deliberation. They needed to stamp out ideas that went counter to what they imposed. Especially, they needed to stamp out the ideas that were authorized—and easily proven to be authorized—by guru (meaning Çréla Prabhupäda), çästra, and sädhu. This means they needed to also stamp out any and all facts, especially historical facts, that threatened their zonal scam. Similarly, later, then threatened the collegiate institutionalism which followed it. They needed to create the illusion of inevitability. They need to cower as many devotees as possible with the prospect that they will be condemned—both in this life and the next—when “ISKCON” triumphalism emerges. They needed to replace genuine intelligence–especially higher intelligence (prajïä)–with emotion. Of course, bhakti-yoga entails emotion, but that was not what they were worried about. Many or most of them were expert at imitating that emotion, but they didn’t want the followers and disciples to imitate it. As such, they invultuated them with mundane emotion in the name of bhakti emotion, in order to cover over their intelligences. On the whole, they were successful in the strategy, especially in the first years of their imposition. That there must be politics in all of this is a no-brainer. You establish a myth, and then cover over all reason, all genuine intelligence, all common sense, and all historical accuracy and facts that could possibly oppose it (or worse, expose it). The movement was run as a quasi-Vaiñëava operation through a combination of crypto-Talmudism and post-modern Machiavellian principles. Diabolical? Of course, but the politics of “ISKCON” inevitability, supposedly non-different from eternal triumph, can never be divine. It takes honesty within oneself to remove any demon of doubt concerning the fabricated, so-called “ISKCON” gerontocracy. The “wise old men” leading that organization know a thing or two about how to provoke negative emotions in anyone who dares to doubt them. They also know how to manipulate doubt in any such bhakta who begins to realize the facts concerning their illicit takeover of the Hare Kåñëa movement. Whenever someone who is (or was) attached to “the best men”—if they consider him important or valuable enough to keep within the confines of their cult—begins to vacillate, that underling is subjected various occult, psychic and verbal devices. These provoke particular negative emotions and feelings in his subtle bodies. The emotions of choice are, of course, guilt and fear. To buttress their efficacy, doubt is also often utilized, although doubt is not an emotion. The all-pervading influence of doubt is not all that difficult to recognize, as long as you want to recognize it. Those leaders know the art of utilizing and invoking it. You should ask yourself: Why do they want to take that risk? It is risky to provoke doubt, because, after all, doubt is a feature of intelligence. Those who have extricated themselves from “ISKCON” first of all had to confront within themselves considerable doubt about its authenticity, about its legitimacy. That was a painful process, no doubt (pun intended), but that was also the proper utilization of doubt. Why do the “ISKCON” leaders play with fire by manipulating doubt in those they wish to bring around to their control? The answer is not difficult to discern: Triggering intense doubt will result in that “wayward” disciple doubting anything and everything. Mal-interpretation of Çréla Prabhupäda’s words (and current and past events) will create turmoil within the minds of those unfortunates, due to bewilderment of memory. As far as this dark tactic is concerned, the more doubt the better. Thus, the foolish chela, unable to discriminate what is right and what is wrong through knowledge, unable to understand what is what, surrenders to his malicious malefactors, i.e., the dragon wins! The fact is that you can doubt anything. You can even doubt that! Bewilderment is there ever-waiting in this universe; unless you struggle against it, it’s always pulling downward (jagat). In the universe, the default is darkness. The default is ignorance. The default is sinful activity and demoniac propensity. The default is atheism. The default is doubt. You have to struggle against all of these things in order to transcend the downward tug, which will attempt to degrade you to the lowest possible position. When you utilize your intelligence in the right way, with fine discrimination and good memory, then doubt becomes a most valuable servant. It becomes so for a brief time, because, if you are seeking out the Absolute Truth, all doubts must be resolved—the sooner, the better. Once that resolution takes place, you can no longer doubt it. There are many apparent contradictions in human life. Would you like them resolved? Resolve them by your service attitude actuated as genuine sevä. Always begin by asking: “Why?” An example of this would be: “Why was that new system implemented? Who benefited from it?” This will start you on the path of putting the pieces of the puzzle together. They can be put together. You can become completely free from the myriad tactics of bamboozlement employed by “ISKCON” mis-leaders, but only if you want to be. There is no doubt about it. Nanda-kumara: The outcome of the battle is already decided. Just like in Bhagavad-gita, we’ve already won. We just have to keep, keep fighting. Very informative I must study further Hare Krishna!